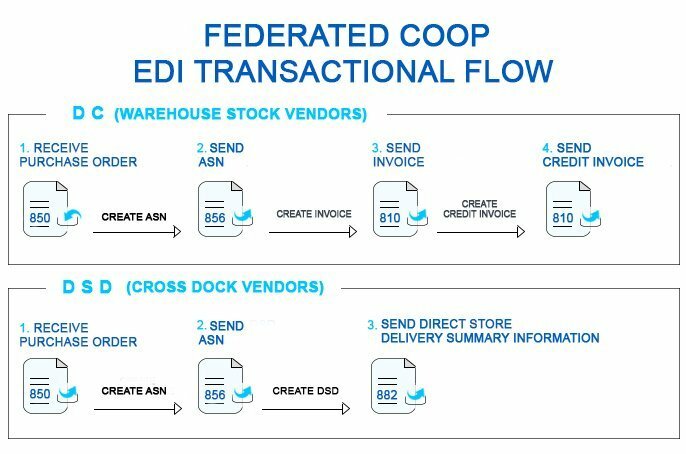 What is Federated Coop’s EDI transactional flow ? EDI implementation is not only a daunting challenge but the various complexities entailed in order to ensure successful execution can be quite overwhelming to master. An effective, and successful, EDI implementation can be measured and determined by its ultimate ability to achieve, as well as consistently maintain, EDI compliance. Albeit a common practice in most retail and grocery industries, the ability to comply with EDI transactions, and meet EDI supply chain requirements and business rules, is exhaustingly difficult and a resource draining endeavour. Nonetheless, one which is unescapable! Federated Co-operatives Limited (FCL), established in 1955 as a cooperative federation, providing procurement and distribution to approximately 365 member cooperatives across Western Canada. This blog is written with Federated Coop suppliers in mind- both new and existing; new vendors who are contemplating to undertake an EDI initiative, and existing vendors who are dealing with the retailer’s new supply chain requirements and newly implemented EDI transactions. Our main goal is to offer an instructive, as well as constructive, framework of information regarding the EDI transactions Federated Coop requires, as well as relevant EDI business rules, all of which we believe to be critical when taking on a challenging and complex task such as EDI implementation. 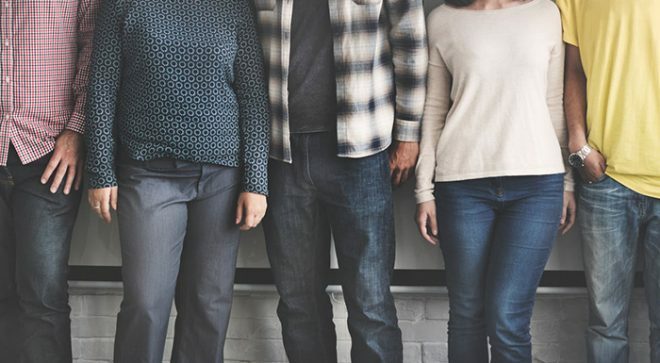 We should start by addressing the concept of EDI itself so to establish an understanding as to what EDI is and why it is used throughout the retail industry. Electronic Data Interchange (EDI) refers to the structured transmission of data electronically between organizations. The benefits of transmitting documents through EDI may be felt in numerous capacities across all business processes including efficiency, due to reduced time and payment delays, decreased labour costs, improved data and inventory accuracy, and increased information accessibility, all of which result in maximized business activity. So now that you have a basic understanding of what EDI is, let’s relate the concept to Federated Coop. How does EDI come into play? Well, EDI is essentially a pre-requisite to doing business with Federated Coop, or any other retailer for that matter. Federated Coop operates under two different EDI supply chains: DC (Warehouse Stock) and DSD (Direct to Store also referred to as Cross Dock). Each EDI supply chain has a set of specific EDI transactions that pertains to it. The two supply chains are not mutually exclusive therefore, as a vendor, you may be required to set up and comply with either supply chain, or both, depending on your business agreement with Federate Coop. By the same token, when it comes to EDI testing, you are only required to complete the testing cycle associated with the supply chain you are set-up for. So let’s examine each of Federated Coop’s supply chains and their required EDI transactions, as well as further tackle the associated EDI business rules and requirements. Federated Coop requires all its supplier community, regardless of supply chain, to be able to receive an EDI 850 purchase Order, and to be able to send an EDI 856 ASN. Warehouse Stock vendors are required to send an EDI 810 Invoice, and an EDI 810 Credit invoice when applicable. In the case of DSD supply chain, cross dock vendors, EDI 810 invoices are not required but rather the EDI 882 Direct Store Delivery Summary Information is. The EDI 882 transaction set is often referred to in the industry as a statement. What do these EDI transactions mean? The following definitions should clarify further what each EDI transaction does in the context of each supply chain transactional flow. I will touch upon related EDI business rules that may pertain to each EDI transaction, per supply chain. The EDI 850 transaction is a Purchase Order transaction set. It is typically used by retailers to place an order with suppliers for goods or services. The EDI 850 provides the same information you would likely find in a traditional paper Purchase Order document. Once in receipt of a Purchase Order (EDI 850), you will need to prepare your shipment and then proceed to create and transmit an EDI 856 ASN. This EDI transaction is utilized to electronically communicate the contents of a shipment to another trading partner. The ASN (EDI 856) must be transmitted and received at the retailer’s warehouse or store facility prior to the shipment. It is essentially a detailed report of the shipment and must reflect its physical content. Federated Coop uses an SOI (Shipment-Order-Item) ASN EDI 856 structure which means that the ASN (EDI 856) must reflect the contents of the shipment as a whole, as opposed to the content of each specific carton shipped. For this reason, the ASN (EDI 856) structure does not include a PACK option, and subsequently, no MH-10/UCC-128 label requirement. Federated Coop allows for the consolidation of multiple purchase orders on a single ASN (EDI 856), should you wish to do so, as long as the ship dates or ship to destinations are the same. Here is where I would like to underline, an important EDI business rule regarding EDI 856 ASNs! All ASNs (EDI 856) must be transmitted and received by the retailer, before the goods are received at the retailer’s distribution center. Failure to meet such requirement will result in non-compliance charges. Examples of non-compliance EDI charges include late or no ASN (EDI 856), invalid or missing mandatory data. It is therefore crucial that you coordinate your shipping logistics with your retailer’s DC appointment and allow yourself sufficient time to pick and pack your goods, create and transmit your EDI 856 ASN to Federated Coop, as well as be able to react in a timely fashion should any issues arise. This EDI rule applies to all ASN transmissions, regardless the EDI supply chain. This is the point in the EDI transactional flow where we will need to differentiate between the two supply chains! As previously discussed, both Federated Coop’s EDI supply chains require the receipt of an EDI 850 purchase order and the transmission of an EDI 856 ASN. The difference lies with the EDI 810 invoice! Warehouse stock vendors (DC supply chain) are required to send an EDI 810 (invoice) and, when applicable, an EDI 810 credit. The EDI 810 Invoice transaction set is the electronic version of the traditional paper-based invoice document. Payment processing of EDI 810 invoice is naturally faster and more efficient than that of paper based invoice since data entry and manual processing are eliminated. It is important to note that you must not consolidate multiple purchase orders on a single EDI 810 invoice. Each and every invoice (EDI 810) must correspond to a specific EDI 850 purchase order. You cannot add items to an EDI 810 invoice which were not on the original EDI 850 purchase order. Finally, Federated Coop allows for either charges or allowances to be applied to EDI 810 invoices. In the case where you need to apply a credit to an already processed and transmitted EDI 810 invoice, the credit would be transmitted as an EDI 810 credit invoice. Once in receipt of a compliant EDI 810 invoice, and EDI 810 credit, as the case may be, Federated Coop will issue payment accordingly. This essentially completes the EDI transactional flow for the DC/Warehouse stock EDI supply chain. Unlike DC/Warehouse stock vendors, DSD/Cross Dock vendors do not transmit EDI 810 invoices but rather EDI 882s. The 882 EDI transaction is a Direct Store Delivery summary Information, also commonly referred to in the industry as an EDI statement. The 882 document provides a summary of delivery, return and adjustment information, or a request for payment for goods delivered. The 882 EDI transaction only offers a summary or adjustment of direct store deliveries; no product detail is provided. In this case, you are required to transmit an EDI 882 in order to be able to receive payment from Federated Coop. This will complete the EDI transactional flow for the DSD/Cross Dock EDI supply chain. EDI 810 invoices or credit invoices cannot be transmitted under this EDI supply chain. It is important to note that the EDI 882 is independent of the EDI 850 purchase order as the latter is not required for the transmission of the EDI 882. Now let’s proceed to discuss EDI testing and EDI compliance! It is quite common for retailers to require mandatory EDI testing whereby the EDI transactions sets are tested in order to ensure your data is EDI compliant with their specific EDI requirements and business rules. Having tested and approved all the required EDI transactions, retailers are able to guarantee a certain degree of compliance, or at the very least, hold their suppliers accountable for any non-compliance EDI errors that may arise while in EDI production. In the case of Federated Coop, ONLY the testing of the 882 EDI transaction is required. The remaining EDI transactions associated with the DSD Cross Dock supply chain, such as EDI 850 purchase order and EDI 856 ASN, are exempt from testing. In other words, only DSD Cross Dock vendors are required to complete the testing of the EDI 882 transaction. Warehouse stock vendors are exempt from all EDI testing. As a cross dock vendor, you will not be moved to EDI production, and therefore, will not be able to receive production purchase orders (EDI 850), until the required 882 EDI transactions has been successfully tested with Federated Coop as compliant. So please be sure to proceed to test your 882 EDI transaction with Federated Coop once your set-up is complete and they are ready to receive your 882 EDI test file. Once again, you do not require an EDI 850 purchase order to be received from the retailer in order to create and transmit an EDI 882. Now, for the question of the hour- who will complete the EDI testing on your behalf? Depending on your in-house EDI capabilities, you may choose to either complete the required EDI testing of the EDI 882 transaction yourself, directly with Federated Coop, or opt to acquire the services of a third party EDI provider, such as EDI Gateway Inc for example, to manage the testing cycle on your behalf. Using fully EDI compliant tools, third party EDI providers typically embed validation maps in their back end systems to allow the tools they use to identify non-compliance EDI errors. Such quality control measures will, in turn, ensure that the outgoing EDI data transmitted to the retailers, in this case, Federated Coop, is 100% EDI compliant with the required business rules and EDI guidelines for each and every EDI supply chain. Regardless if you are set-up for either or both of Federated Coops supply chains, we highly recommend that you go through the vendor manual to thoroughly familiarize yourself with all the different EDI business rules associated with each of the EDI supply chains. This is particularly valuable if you are integrated and are using your own in-house EDI system to transmit EDI documents to Federated Coop; having a good base of knowledge for the relevant EDI transactions will allow for a smooth business process, while reducing the risk of unnecessary EDI non-compliance charges. So now that I have mentioned integration, let’s discuss it further! Suppliers doing EDI often explore different opportunities to integrate their EDI transactions, especially when it comes to EDI transaction of high volume. Integrating through your accounting package or ERP system, or even using FTP file transfer platforms, will allow you to generate and transmit EDI files through an automated process, while eliminating all manual intervention, and achieving 100% EDI compliance, increasing productivity as well as reducing EDI transaction costs. The integration option is especially efficient, as well as cost effective, when it comes to DSD supply chain vendors (cross dock) who are required to transmit EDI 882 per store, resulting in a high volume of 882 EDI transactions. Not to mention a time consuming and error prone feat since there is no EDI 850 purchase order to turn around and generate the EDI 882 from. When it comes to production status, Warehouse Stock vendors are deployed once set-up is completed since no testing is required for this supply chain; DSD/Cross Dock vendors will be moved to production once the EDI 882 is tested successfully. Production EDI 850 purchase orders will then be transmitted, allowing you to be on your way to exchanging EDI transactions with Federated Coop! Nevertheless, it is important to note, that Federated Coop may choose to implement in the future new EDI transaction sets such as EDI 810 for its DSD/Cross Dock supply chain vendors, at which point you will be required to be able to support and comply with its new EDI requirements. Remember, knowledge is Key! Regardless of the retailer you choose to embark with, when implementing EDI, acquiring knowledge and information relevant to EDI business rules and related requirements you must meet and comply with, will allow you to be better prepared to overcome the challenges associated with such EDI implementation. (anchor text 5 elements to a successful EDI implementation). We trust that this blog has been informative and we wish you luck with your EDI initiative with Federated Coop! 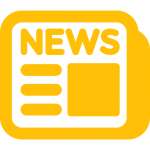 We invite you to sign up to our company newsletter! You will then receive an invitation to our Webgate+ webinar this coming March 2017, featuring Federated Coop! Business rules required by Sobey’s suppliers implementing EDI.